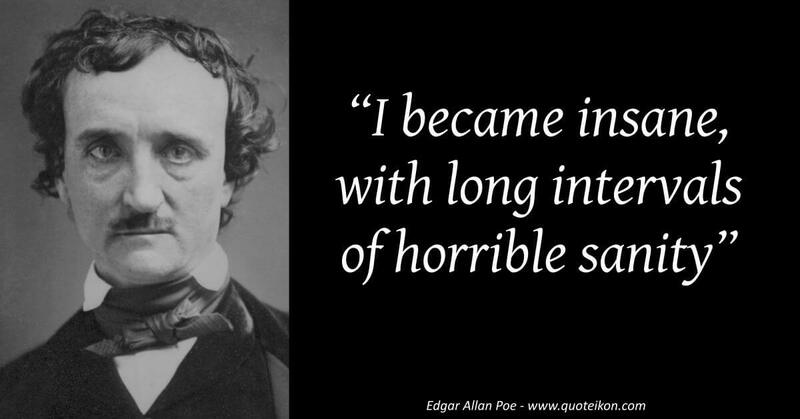 Quotes about Edgar Allan Poe: The acclaimed English author D.H. Lawrence spoke insightfully of him "He was an adventurer into the vaults and cellars and horrible underground passages of the human soul. 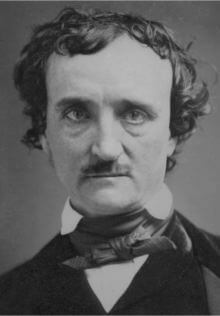 He sounded the horror and the warning of his own doom"
The author James Grover Thurber remarked about his fondness of liquid refreshment: "Poe...was perhaps the first great nonstop literary drinker of the American nineteenth century. He made the indulgences of Coleridge and De Quincey seem like a bit of mischief in the kitchen with the cooking sherry"
"I became insane, with long intervals of horrible sanity"
"Believe only half of what you see and nothing that you hear"
"The believer is happy. The doubter is wise"
"There is no beauty without some strangeness"
"To observe attentively is to remember distinctly"
"Men have called me mad; but the question is not yet settled, whether madness is or is not the loftiest intelligence"
"The scariest monsters are the ones that lurk within our souls"
"There are some secrets which do not permit themselves to be told"
"If you run out of ideas follow the road; you'll get there"
"I wish I could write as mysterious as a cat"
"Stupidity is a talent for misconception"
"The past is a pebble in my shoe"
"I am above the weakness of seeking to establish a sequence of cause and effect, between the disaster and the atrocity"
"Reality is the number one cause of insanity among those who are in contact with it"
"The ingenious are always fanciful, and the truly imaginative never otherwise than analytic"
"I have great faith in fools; Self-confidence my friends call it"
"The eye, like a shattered mirror, multiplies the images of sorrow"
"Years of love have been forgot in the hatred of a minute"
"In my 'time' it's always midnight"